Besides, the historian is involved in book publishing and writing books and textbooks, which are used by up to a quarter of all Ukrainian school students. He serves on the Ukrainian-Polish and Ukrainian-German historical commissions, participates in working groups of the Ministry of Education and Science of Ukraine which deal with reforming historical education and new approaches to it. Shchupak co-authored new history curriculums and many other research and educational projects, in particular, atlases of the history of Ukraine. “I am now writing a textbook on interwar world history which addresses controversial issues, in particular, I touch on the Holocaust and the Holodomor in the context of comparing different genocides,” Shchupak said. It was this, as well as the partnership between Ukraine and Israel and the intersections of human fates in the historical context, which we talked about at the Tkuma Institute, which is located on the premises of the Menorah Jewish community center. Recently, member of the Israeli Knesset Akram Hasson introduced a bill on the recognition of the Holodomor as genocide of the Ukrainian people. Den/The Day newspaper has always paid much attention to this issue, starting long before it was raised at the state level during Viktor Yushchenko’s presidency. The famed researcher of the Holodomor James Mace worked for Den/The Day as well. What is your personal take on this problem? “This question is directly related to my research work. I study the Holocaust, one of the worst genocides in the history of humanity. For this, it is important to understand what the genocide is in general, where this definition comes from and how it relates to other similar tragedies. Raphael Lemkin, a Polish lawyer of Jewish descent, began to study the mass extermination of people by researching the genocide of the Armenian people in the Ottoman Empire. After that, he studied the Ukrainian Holodomor and came to the realization that the genocide was a particularly tragic phenomenon, the most terrible one in the history of humanity. And when after World War Two Lemkin submitted documents to the newly constituted UN, he saw the Armenian tragedy, the Holodomor of the Ukrainian people, and the Holocaust as the classic examples of genocide. But the Soviet Union was among the victors in World War Two, and it could not let itself be condemned along with Nazi Germany for organizing mass genocides. Therefore, targeting social groups was excluded from the definition of genocide, limiting it to the destruction of a certain group of people based on racial, national, or religious criteria. In Ukraine, it was the Ukrainian peasantry, which actively opposed the Soviet government, that was destroyed. There was insurgent movement in many regions of Ukraine, which debunked the stereotype that Ukrainians were supposedly resigned to their fates. As for the Holodomor, we study it in the general context of genocide. After all, when talking about the Holocaust, we cannot avoid mentioning the Ukrainian Holodomor, or, for example, the deportation of the Crimean Tatars. “By the way, our Crimean Tatar friends, who are historians and journalists, came to us a few days ago, and we opened an exhibition of photos of Crimean Tatar children whose parents are held as political prisoners in the annexed Crimea. And before that, we created the first permanent museum exhibition in Ukraine devoted to the deportation of Crimean Tatars and other peoples of Crimea. 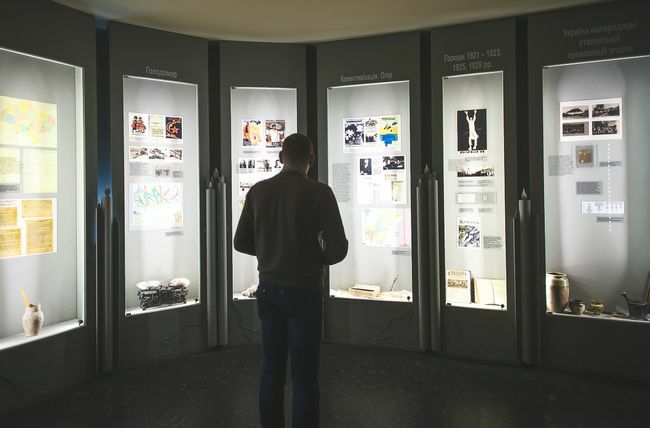 “Of course, we felt we had to create a Holodomor exhibition in the Holocaust Museum. To do this, we turned to experts, including Doctor of Historical Sciences Liudmyla Hrynevych, who heads the Ukrainian Center for Holodomor Studies in Kyiv. We also sought help of our friends from Canada, for example, Valentyna Kuryliv, who was among the first people to introduce the Holodomor studies to educational institutions. We mention the Holodomor in various contexts. “Here is my book The Holocaust in Ukraine: Finding Answers to History Questions, which is a textbook approved by the Ministry of Education and Science of Ukraine for use in educational institutions. It contains a separate section on the Holodomor, which took place on the eve of the Holocaust. There is a moral aspect to this problem as well. If we want to understand the Crimean Tatars, we must understand the Jews who perished during the Holocaust, and perceive the pain of Ukrainians who were killed en masse by starvation in 1932-33. ‘There is no alien pain’ is the motto which is a certain moral imperative, and we work according to it. And, as far as the victims of the Holodomor are concerned, then, of course, an overwhelming majority of those victims were ethnic Ukrainians. But I must say that there were other victims of the Holodomor as well. There were Russians, Poles, Belarusians, Tatars, Jews who resided in the areas affected by the famine. If you take the Jewish districts that were created in the 1920s and where the Jewish population was concentrated, there were victims there too. I know it not only from documents and books, but from my own family story as well. It is because my grandfather, my dad’s father, who lived in the village of Konetspol in the Pervomaisk raion of the Mykolaiv oblast, perished during the Holodomor, just like many of his relatives and friends. My aunt Sofia Shchupak, who is currently living in Israel, is about 90 and still remembers that terrible time. Surprisingly, she remembers which plants may be eaten and which may not. That is, an elderly person has this terrible story carved into her memory. Ukraine has passed a number of legislative acts on the recognition of the Holodomor of 1932-33 as genocide of the Ukrainian people. In January 2010, the Kyiv City Administrative Court’s ruling even named leaders of the All-Union Communist Party (Bolsheviks) as perpetrators of the Holodomor, although it then closed the case due to them being dead. But no full-fledged trial has been held in Ukraine, which would dot all the ‘i’s. “You are saying right things. The fact is that a crime which does not get punished provokes its repetition. The world would be different and better if there was an immediate reaction to the destruction of one and a half million Armenians. The international community effectively overlooked it. The story of the Holodomor in Ukraine was also suppressed by the Soviet Union and even by a large part of the Western intelligentsia, which believed that an interesting experiment was being conducted in the USSR for the sake of the working people, and thus refused to see the fact that these workers were being destroyed by famine and repression. Was not it strange when famous writers and journalists came to Belomorkanal and did not understand who was building that canal? There were, of course, honest people who spoke the truth about what was happening, but they faced an unwilling audience. And this attitude regarding the mass destruction of people made possible further tragedies. Famous American historian Timothy Snyder and Ukrainian historian Yaroslav Hrytsak draw our attention to this. “Holding the Nuremberg Trial and condemning Nazi criminals was very important regarding the Nazi ideology. In that trial, the court condemned crimes against humanity, including the particular policy of ‘the final solution to the Jewish question’ – the Holocaust, which is estimated to have killed about 6 million Jews. But there has been no trial of those responsible for the crimes of the communist regime of the USSR. Why is it so? I think that in 1991, when Ukraine gained independence, an overwhelming majority of the population still felt connected to the Soviet past, accepted Soviet history. And the political elite that came to power in Ukraine did not actually break with this Soviet past, but was directly connected with the communist system. Ukraine, ideologically and politically, was living in two worlds: on the one hand, it talked about its aspirations towards Europe and European values, and on the other, it strived for an alliance with Russia, which proclaimed itself the successor to the Soviet Union. And in fact, the abandonment of the Soviet legacy, of the totalitarian past, began in Ukraine only under president Yushchenko, who tried to embed memory of the Holodomor into the center of the national idea. This was fundamentally correct, but the methods used were not very popular and ineffective, and prompted many people to oppose it. It was because this often was done by Soviet methods, in particular, it was forced through the education system, which lacked proper training and methodological effort. Still, a major step in the formation of national memory was made, and Yushchenko’s role in it should be recognized. So, why has such a trial not been held internationally? What are the obstacles? “My opinion is that this, of course, should be done. But for any serious trial, we must have political preconditions met first. There has to be public demand for it. We must be aware that a large part of Ukrainian society still has Soviet or post-Soviet consciousness. And this is not only a part of the older generation, but also young communist perverts, if one can label them like this. Under these conditions, holding such a trial will lead to an even worse political crisis in Ukraine. Perhaps this explains why recognition of Holodomor on the world stage is being a bit stalled? “I see several reasons for it. The first one is that in Israel, it was decided at the political level long ago not to recognize any such event as genocide, be it the Armenian genocide, or the deportation of the Crimean Tatars, or the Holodomor. It is because that country’s national idea is formed around the historical memory, in particular that of the Holocaust, and any mention of other genocides is not always adequately perceived by historians and the political elite. 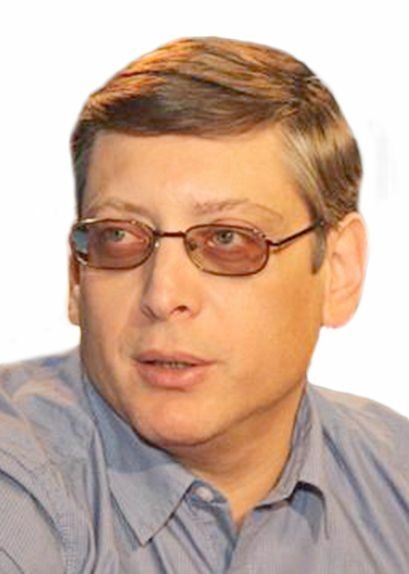 True, leading Holocaust scholars such as Professor Yehuda Bauer, who once wrote about the uniqueness of the Holocaust, now say that it was unprecedented in scale, organization, and universality, thus recognizing that such tragedies happened before, and the same Armenian genocide or the Holodomor can be listed as ones which typologically were closest to the Holocaust. And, of course, there is still a certain conservative tradition among scholars in Israel. Akram HASSON, a member of the Israeli Knesset: Three months ago, I was a guest of the Verkhovna Rada. I arrived in Kyiv as part of an Israeli parliamentary delegation. We met with members of the parliamentary Ukrainian-Israeli friendship association, it includes 130 members of the Rada. They invited me to visit the Museum of Holodomor. Not knowing what they were talking about, I agreed. I was the only member of our delegation who went there. “For me, it was all new, and I decided that people should know what happened then. I began to study the issue, to find out what happened under Joseph Stalin in the Soviet Union, and I realized that they carried out a policy of deliberate killing by starvation. It had its rules, it involved soldiers and officials who were sent there. So, more than three million people died, and some believe that the true figure was about ten million. But still, is the idea of recognizing the Holodomor as genocide present in Israel? “Of course, and we spread it, we try to maintain a dialog with our fellow scholars. When saying ‘we,’ I mean Ukrainian scholars, the Jewish community of Dnipro, people who have contacts in Israel. What are the ways of spreading such ideas? Firstly, we do it through research. Secondly, it is done by involving Israelis – academics, politicians – in those processes that are taking place. These include museum exhibitions, academic conferences, archival work, and the declassification of documents. If we find interesting intersections of the fates of people during the Holodomor and the Holocaust, then this must also shape opinions in Israel in a certain way. What exactly do you tell about the Holodomor in your Holocaust museum? Editor-in-chief of our newspaper Larysa Ivshyna believes that should Israel recognize the Holodomor as genocide of the Ukrainian people, it could contribute to strategic cooperation between Israel and Ukraine.